His message blames 'liberals' for spreading 'false information' over a recent news release by his administration, and says he has done a lot for seniors. Gov. Paul LePage launched a phone campaign this week seeking to control damage caused by his recent statement that categorized Social Security as welfare – a statement that could be a liability for him among senior citizens, an important voting bloc in Maine. The effort by LePage’s re-election campaign follows the controversy sparked by a news release issued by the governor’s office last week, while he was on a trade mission in China. This week’s minute-long automated call features a pre-recorded message from LePage, in which he blames “liberal newspapers” and “liberal politicians” for the controversy and highlights his policies that have benefited seniors. “I do not believe Social Security is welfare. 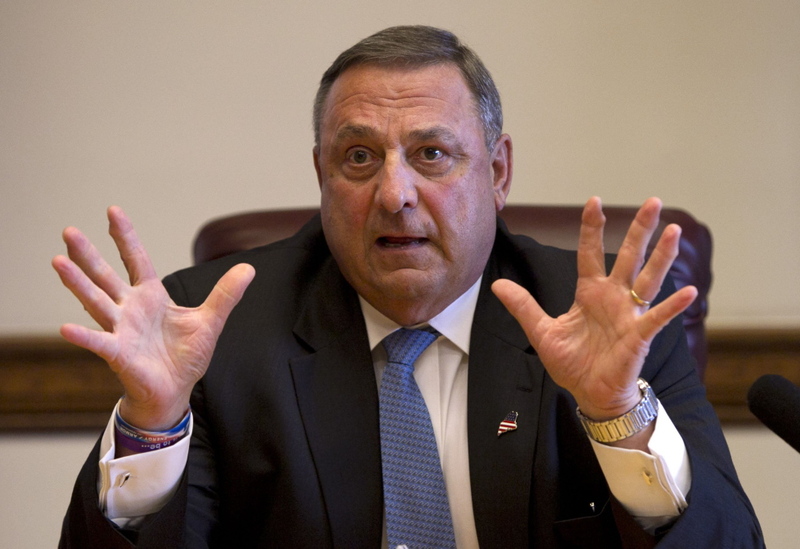 Unfortunately, liberal newspapers, owned by a billionaire who opposes me, with liberal politicians Michael Michaud and Eliot Cutler, presented you with false information,” LePage says in the call. LePage doesn’t explicitly identify the Portland Press Herald, which first reported the story and whose majority owner is S. Donald Sussman, the financier and philanthropist who is married to U.S. Rep. Chellie Pingree, D-Maine. The phone campaign underscores the importance of winning senior citizens’ votes in Maine, which has the second-highest proportion of residents 65 and older and the highest proportion of baby boomers in the United States. According to U.S. News and World Report, 76 percent of Maine seniors voted in the 2010 elections, second only to Washington state and well above the U.S. averages of 61 percent for senior citizens and 46 percent for all voters. Maine’s turnout for voters of all ages in 2010 was 57 percent. A poll conducted for the Press Herald by the University of New Hampshire Survey Center from June 12-18 showed Michaud, the Democratic candidate, with a slight lead among senior citizens. Forty-six percent of all respondents said welfare does more harm than good, and 41 percent said welfare recipients don’t need it. LePage has made welfare reform a central issue in his campaign. Michaud recently called for the creation of an Office of Inspector General in the state Department of Health and Human Services to root out fraud and abuse. And Cutler, an independent candidate, has talked about the need to make it easier for people to make the transition from welfare to work. This week’s robocalls were paid for by LePage’s re-election campaign. Brent Littlefield, LePage’s political adviser, would not provide additional information about the calls, including the cost, the number being made or who is being called. LePage’s Social Security statement came as his administration defended Maine’s economic performance in light of newly released federal data ranking Maine’s personal-income growth for the first quarter of 2014 as 39th nationally and last in New England. One of the biggest reasons the Bureau of Economic Analysis cited for the low ranking was Maine’s refusal to expand Medicaid under the Affordable Care Act. LePage’s office sought to clarify his statement the next day, saying that he was referring only to Medicaid as welfare. But Michaud and Cutler pounced on the governor, calling the remark an insult to Maine’s senior citizens. In this week’s robocalls, LePage takes aim at Michaud. Lizzy Reinholt, spokeswoman for the Michaud campaign, accused LePage of “backtracking” after realizing that his views aren’t held by most Mainers. In a written statement, Cutler said the governor bears the responsibility for his statement.